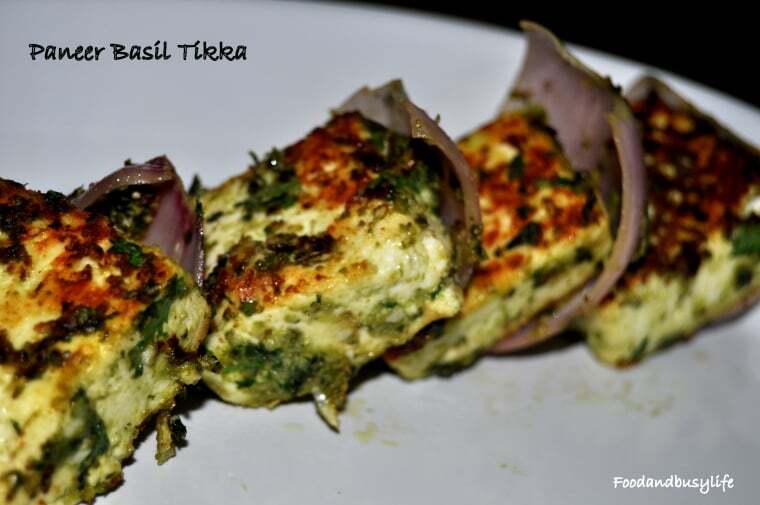 Hello Friends, as promised yesterday here i am happy to share with you all my recipe of paneer basil tikka. I personally love the taste of basil ,either a fresh basil tea in the morning or basil pesto sauce in chicken :D.
There are different types of basil, which differ in taste and smell. Sweet basil (the most commercially available basil used in Italian food) has a strong clove scent. 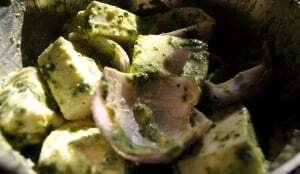 Take the paneer and slice it into large cubes.Take the onion and cut it into half and than take out the layers with your finger tips.Make a paste of basil leaves ,coriander leaves,garlic and green chilli in a blender. Marinate the paneer and onion with this paste and hung curd for 15minute in fridge.Season with salt as per taste. Now either you can grill it in oven or can do it on your non-stick pan on gas flame.I did the later. Oil your pan and than place the paneer cubes first on a low flame,as paneer take very less time to cook.After 2-3minute turn paneer slices other side ,you can see the golden brown color.Now cook the other side till you reach the same golden color. Once you are done with paneer slices,cook the onion with the rest marination on high flame for 2 minute.